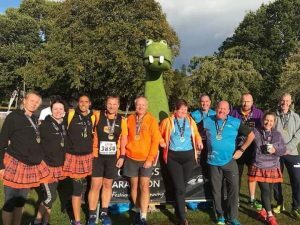 A number of the “Orange Army” ventured north of the border in September, to take on the challenge of running the “Loch Ness Marathon“. Did I say north of the border? Better make that 243 miles north of the border! 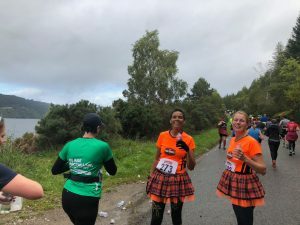 The challenging event (well, it would be, it is a marathon) is a point-to-point, with buses taking runners to the start point, somewhere between Fort Augustus and Foyers; everyone then running ‘home’ to Inverness. 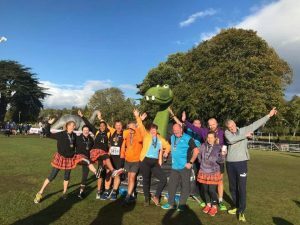 This is an event which receives glowing reviews, and certainly reports from the Road Runners spoke of a fantastic event. Sadly, nobody managed to capture evidence of Nessie (no, I’m not counting that big fake one!). Bad luck everyone, that mean’s you’ve got to go back and do it all again! First man across the line for the BTR Road Runners was David Ward, with a time of 3:50:55; first lady across the line for the BTR Road Runners was Dawn Hunt, with a time of 4:11:35. Well done everyone who took part! As ever, we warmly welcome new members, so come along and join us, and see what road trips we’re embarking on in 2019!